Passorn Brasserie is the second restaurant for Passorn. The Brasserie is situated on Hanover Street, so is a little more central location that their first restaurant in Tollcross. We visited early on a fairly quiet Tuesday. We hadn’t booked but this wasn’t a problem at the time we went. The interiors were slick and polished and gave an impression of space with some cleverly placed mirrors. Once seated, we were handed both the a la carte and the pre-theatre menus. The pre-theatre menu was good value, with two courses plus a glass of wine or a cocktail for £19.50, so we decided to go for that. Chilli symbols on menu indicated heat, which seemed to be accurate based on the taste of the food. I chose the Tom Yum Kai (chicken hot and sour soup) followed by the Panang Kai (creamy red chicken curry). My dining companion went for the Pla Chao Wang (crispy sea bass Thai salad) followed by Kaeng Keaw Wan (Thai green curry with king prawns). 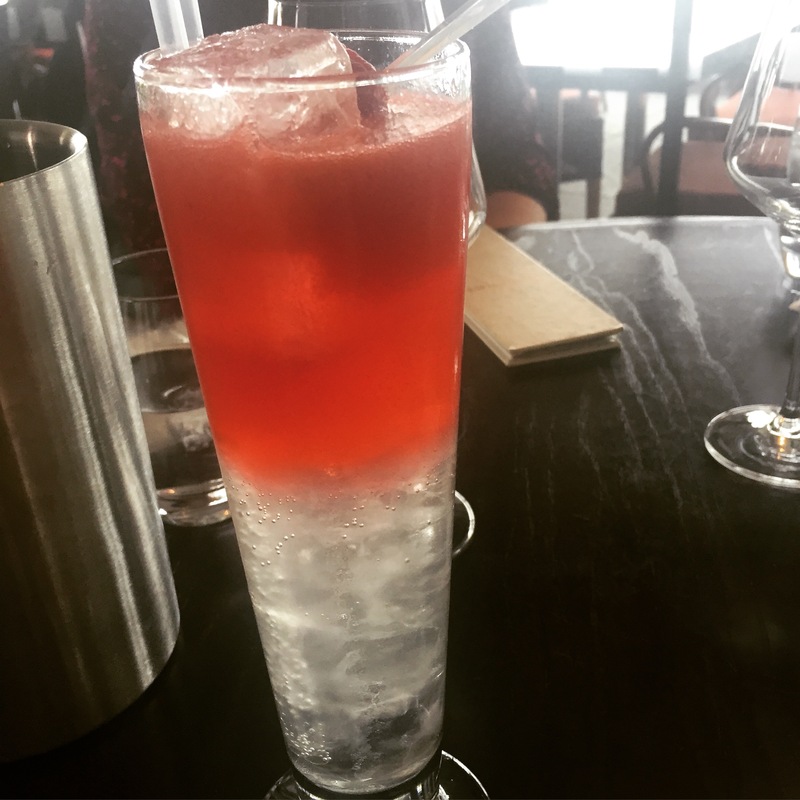 We also ordered a cocktail each – Pink Passion and Thai smile – both of which were excellent. We were not waiting long before our starters arrived and smelt amazing. My soup was perhaps a little hot for me (I should have heeded the chilli symbol!) but it had lovely flavour, permeated with fresh Thai herbs. The chicken was particularly moist and the contents were plentiful. On the other side of the table, the salad was fresh and vibrant. It came with mango, cashew nuts and a tasty lime juice dressing. The mains were served in cute little bowls and automatically come with steamed fragrant Thai rice (as is the same with all the mains). My red chicken curry was delicious. It was beautifully was creamy and thick, without being gloopy. Again, the chicken was excellent. The peppers were also great and added an extra element to the dish. My friend was equally enjoying her green curry. This definitely had more heat in than the red, which suited her palate. Overall we had a nice experience at Passorn Brasserie and offers good value for their pre-theatre menu. Cost £39 for two pre-theatre meals consisting of two courses and a cocktail each. I had actually already visited Ting Thai Caravan but had stuffed my face so quickly that I forgot to take any photos. Instead of producing a photo-less review, it was a good excuse to go back. Ting Thai has had a buzz about it ever since it opened. It has a communal eating style, so you have to be prepared to potentially share your table (perched on stools) and it is busy so there is a high chance this will happen. This time I opted for massaman ped with a side of coconut rice and my friend chose pad see-ew. We also got a couple of sides: mun tod (sweet potato crispies) and cap moo (crispy pork skins). We were sat facing out the window so it did take a little while to catch a waitress’ attention to place our order. The food came pretty quickly (which is a design of the menu). The wet mains, such as curry and soup, are served in bowls but other dishes such as noodles and salads are served in boxes. I was a little surprised that the duck leg in my massaman curry was still on the bone rather than flaked in. It did make it a little difficult to eat, having a bone in the middle of your bowl. However, that was the only down side I could find. The duck itself was cooked well and the curry had excellent flavour. I dunked in plenty of rice to soak up the sauce. Delicious! My friend loved her noodles. She said the food was spicy hot but that was a good thing. It certainly looked vibrant. The crispy pig skins were a little flavourless on their own but were utterly moreish when dipped in the Ting chilli jam. However, the star was definitely the sweet potato crispies, which were essentially light battered sweet potato chips. Dipped into sweet chilli sauce created a wonderful combination. I could have eaten just a massive bowl of these. We were getting a little warm in the crowded restaurant so we’re pleased to get outside but it was worth it for some yummy Thai fast food. Would I eat here again? Yes! Another meet up with Zomato brought me to this little Thai restaurant situated in a basement on Howe Street. This site has been taken over from a previous Thai with perhaps a below par reputation, which may cause a few problems for the new owners initially. We went to see what this place had to offer, particularly as they were offering seafood as their speciality. We had a cordial welcome from the friendly staff. They seemed knowledgeable and were obtaining seafood locally, confirming that the seafood that would be in our starters was from the 5pm catch at Leith Docks. We were to have a selection of their starters each and then we got to try something from the chef’s choice – and I opted for the roast duck curry. The selection starter plates showed a good variety. Everyone around the table seemed to have different favourites. Mine was the scallop with mango and chilli type salsa. Not everyone seemed to have a well-cooked scallop but I thoroughly enjoyed mine. The calamari was excellent and not chewy. The prawn salsa was incredibly fresh tasting. I was pleasantly surprised by the sun dried pork as it was softer than I expected and had an incredible depth of flavour. The chicken wing was appetising and not too salty. Overall this seemed to be the biggest hit in the group. The accompanying dips were nicely balanced and worked well with all of the starters. When the duck arrived, it came in a Thai red curry type sauce. Mine seemed a little oily on top but others who had the same dish didn’t experience the same. Regardless, this wasn’t obvious in the taste. There was plenty of duck in the dish. I also really enjoyed the addition of pineapple and grapes (the latter I would never have thought to have added). The rice was incredibly well cooked. Looking at the menu, this would have been at a reasonable price but some of the signature dishes seemed a little on the pricey side. I believe the owners have come up from London so may find they adjust the more expensive dishes in time. We did also order a crispy garden salad which was a battered deep fried salad whch came with a tasty minced chicken and prawn sauce combination. The sauce was a suprising hit across the entire table. 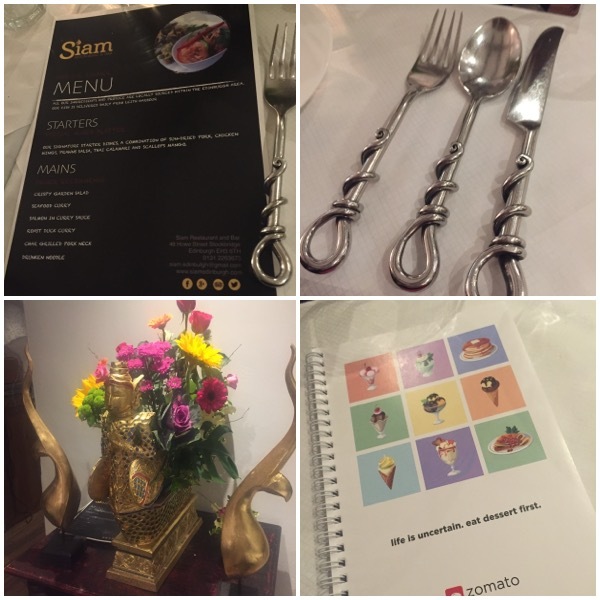 I enjoyed my visit to Siam and the setting was nice. I hope this place manages to shake off its predecessor’s image. 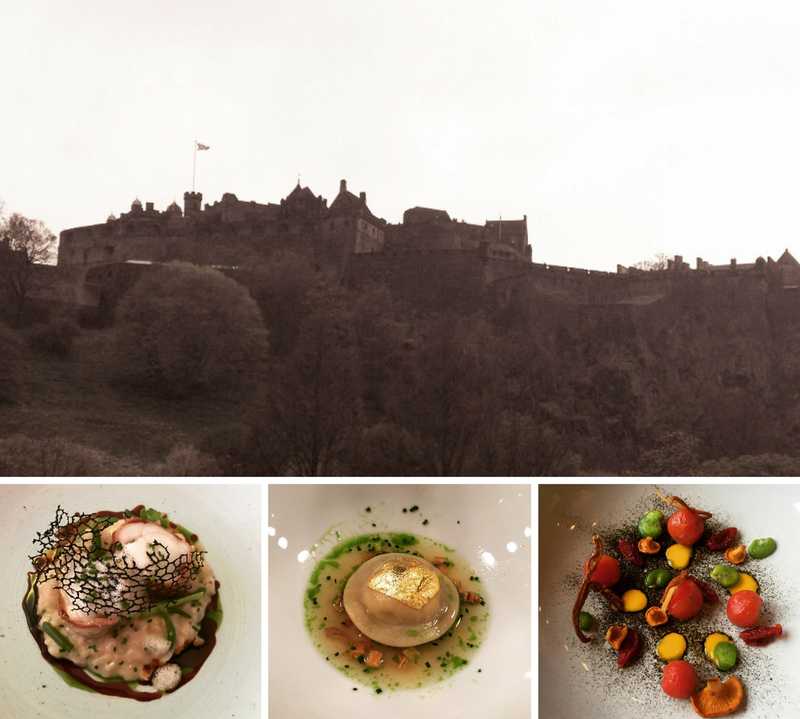 Situated in Castle Street, Chaophraya is perfectly located for beautiful views, both of the castle and of the Forth. Whilst part of a chain, Chaophraya does its best to feel like one of a kind. The restaurant is beautifully decorated, complete with a soothing fish tank. Whilst we were not seated with a window view, we still managed to be able to see outside. 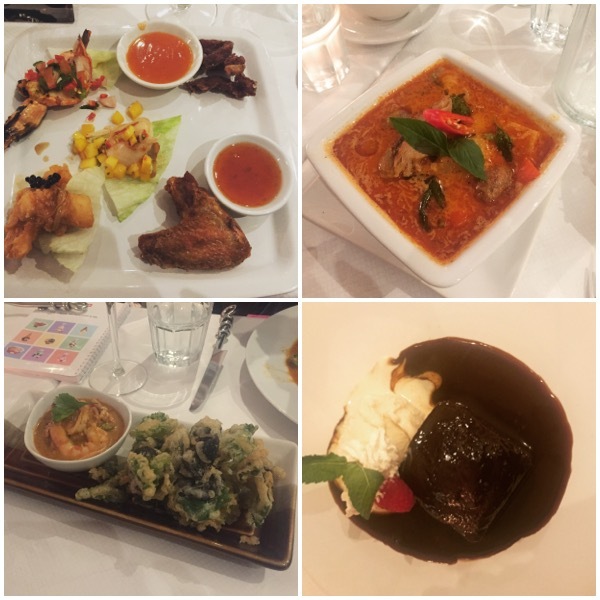 With an extensive Thai menu on offer, it was very difficult for us to choose what to have. In the end, we opted for the Asian platter to start and they were very accommodating with letting us order for two people but share between three. 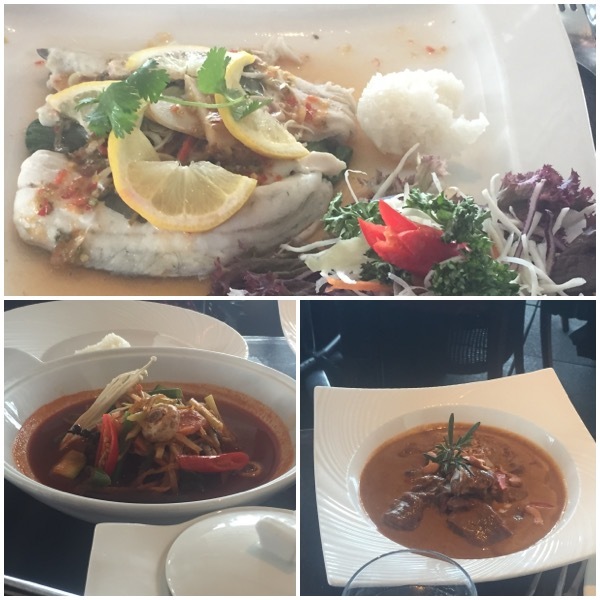 I then went for the steamed sea bass whilst my friends went for the jungle fish curry and the lamb massaman curry. We got a sticky rice and a coconut rice to share. When the starter platter arrived, it was placed on a little stand in the centre of the table (I was so engrossed in our conversation I forgot to take a photo). The platter had a nice array of starters; chicken spring rolls, prawn tempura, chicken satay, marinated pork with honey, a duck salad and accompanying dips. Most of these you could get from the main starter options if you so wished but the platter was a good way of getting to see what you liked the most. They were all very delicious and there didn’t seem to be a dud in the lot. I have to say my favourite was the marinated pork as it was juicy and full of flavour. Moving onto the mains, I don’t think any of us were disappointed. I had opted for the sea bass which arrived in plentiful supply. The lime and chilli sauce was a masterpiece and really brought the dish alive. I almost forgot there was pak choi in the dish as it was hidden away under the fish, which was a bit of a disservice to the vegetable. Even the salad that came with it was of a good quality. Both the coconut and sticky rice were delicious, although the sticky rice was so sticky it was difficult to break a spoonful off to get onto your place but it wasn’t problematic once eating it. The jungle fish curry was hot (as warned on the menu) and was enjoyed happily. As this is not a creamy curry, it works perfectly for lunch as it doesn’t overfill you. The massaman was also enjoyed. Although it was a bit heavier due to the coconut milk and potatoes, it didn’t stop my friend having a good crack at polishing off the lot. As we were clever in what we ordered for our starters, we had just enough room for dessert. I went for the bananas in sweet coconut milk whilst the other two decided to share a fondue. Now, the bananas were about as comforting as you can get, without expanding your stomach to twice the size. A couple of strawberry halves were placed on top as an added bonus. I could have eaten this dessert all afternoon. I felt I was being hugged as I ate it. One the other side of the table, the fondue was getting stuck into. 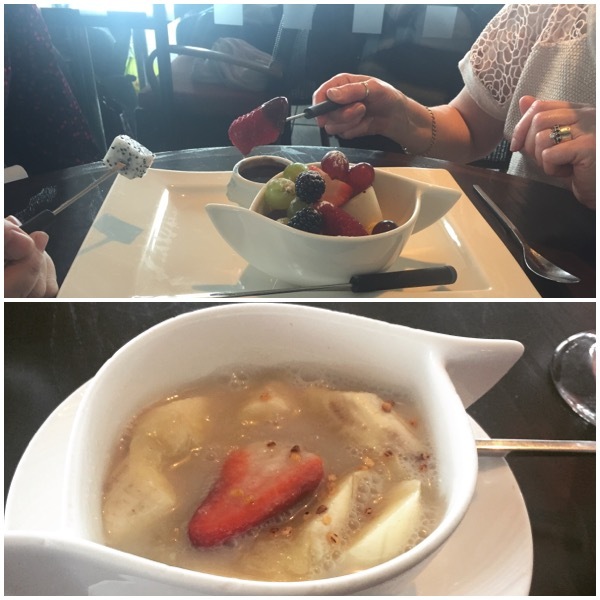 Whilst not a typical fondue, fruit was served with a small pot of chocolate that the fruit could be dipped into. Not fussy but tasty. The service was lovely throughout. All the waiting and front of house staff were helpful and friendly. I would definitely come again. I need to work my way through the menu! This venture started out in Newhaven and opened up just off Broughton Street a couple of years ago. Port of Siam offers a small, refined dining setting. However, whilst it is a relatively small venue, there is still an air of space in the place, where tables are not packed in so you don’t feel overlooked by the neighbouring diners. Adjoining the restaurant is Bangkok Bar, which serves bar food and drinks plus the newly opened downstairs area that offers drinks and karaoke. I was accompanied by my sister for this visit, which will explain why I completely forgot to take photos of our main courses as we we gossiping too much. She hadn’t had much Thai food so was keen to see what this place had to offer. 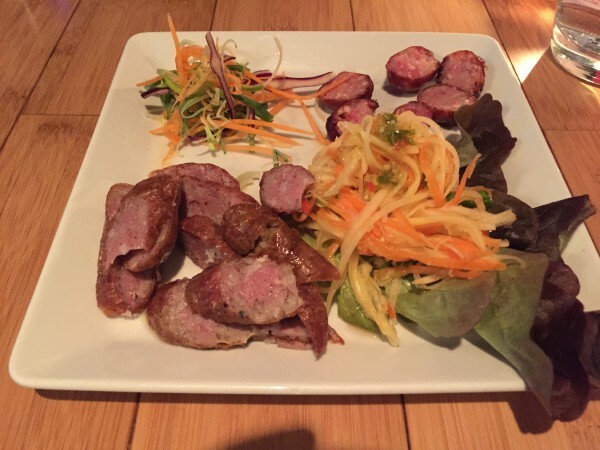 I opted for the Thai Sausage duo followed by the sizzling duck, whilst my sister went for vegetable spring rolls followed by beef pad Thai. I wasn’t sure what to expect with the sausages but they had been supplied from the award winning Crombies just across the road, so I felt it would be a safe bet. They arrived already sliced, in individual piles and with a side of Thai salad. Each sausage was subtly different but they complemented each other. They had a little bit of a kick but a pleasant one. The salad also had a kick. Unfortunately I wasn’t paying a great deal of attention as I scooped up my first bite. The chilli had been placed on the top in order for the diner to control the heat. I got it all in one mouthful and had to down my water to put the fire out! That’ll teach me for nattering when I should be paying attention to the delicious food. Luckily that didn’t spoil the rest of the starter, which is a testament to the standard of the food. 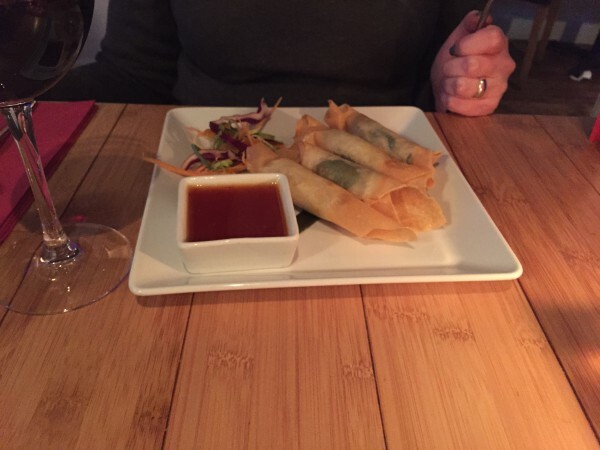 My sister felt that her spring rolls were definitely the best she had ever eaten. She commented that they were light and not greasy. She did find the accompanying chilli sauce a little too hot for her sensitive palate but I gave it a taste and thought it was just about right for a dipping sauce, with what I would call a medium level heat. You could hear my main coming before you could see it! The sizzle was enough to make other diners turn round to see what all the noise was about. The duck arrived on a cast iron hot plate and I had ordered a side of sticky rice which came in a small bowl. The duck was very flavoursome, which carried through to the sauce and vegetables. The veg still had a bit of crunch to them – no overcooking here. The duck was tender and was a nice contrast to the vegetables. The accompanying rice was truly sticky and sumptuous. This main was a well sized portion and filled me just the right amount. My sister’s pad Thai was served on the plate but had tiny piles of spices on the corners of the dish, to enable the diner to increase the spice and heat to their taste. I think this was a nice touch, particularly in my sister’s case, as she would prefer a milder option. She enthused over the dish, exclaiming how tasty it was. I can attest to this as she was unable to finish the dish so we asked if we could get the remainder wrapped up (it was a shame to waste such good food) and had it for lunch the next day. It still had great flavour 18 hours later. We couldn’t fit in dessert but the restaurant offers a good variety of dishes. This restaurant was lovely, with tasty food, great service and a pleasant environment. This would suit close gatherings and intimate dinners alike. I cannot wait to go back.